My predilection for Brazilian music I’ve expressed in an earlier SoTW about the song ‘Mambebe’. This week I’m pleased as punch to share with you a small taste of the very spiritual experience I had hearing Hermeto’s two sets at the Red Sea Jazz Festival a month ago. They started at 1:15 in the morning, in withering heat, and continued till the organizers turned off the electricity, much to Hermeto’s chagrin. The band comprised seven members, all of them making wondrous sounds on a myriad of implements. The performance was as much of a trip as The Grateful Dead concert, just with all that Brazilian joie de vivre. The festival took place at the end of August, on the cusp of the month I spend in the house of worship of my choice. Throughout his sets, when my consciousness came up for air, I couldn’t help wishing I could be so immersed, so riveted, during my non-secular prayer. pumpkin fife he crafted. He would immerse himself in the lake, creating sounds with the water, and hang scrap metal from his grandfather’s blacksmith shop on a rope, banging on various shapes to explore their sound. This led to his approach to music, in which the tones themselves are more central than chord progressions, scales, or modes. When Hermeto was 11, his father quit playing the 8-bass accordion in his son’s presence, because his son’s abilities so surpassed his own. He had a long and varied career in Brazil in the 1950s and 1960s. In 1971 he came to New York, where he performed two of his songs with Miles Davis on the “Live-Evil” album, Nem Um Talvez (Not Even a Maybe) and Igrejinha (Little Church). Since then he’s been based in Brazil, recording some 80 albums in various formats and traveling the world. From June 23rd, 1996, through June 22nd, 1997, he wrote one composition a day, no matter where he was, ‘so that everyone could have a song for their birthday.’ Here’s mind-boggling example of Hermeto composing a song. I’ve watched it numerous times, and I still don’t believe my eyes and ears. In 2002 he met the young singer Aline Morena, who has become his wife and a key member of his band. She plays 10-string guitar and sings. In both sets in Eilat she performed a piece in which she dances and sings while providing percussion by stomping her feet and slapping her body. It was so joyous, so invigorating, so super-physical that the thousands of people in the audience stood enthralled, jaws hanging open, dumbfounded and charmed beyond sense. Here’s a lovely example of the two of them making music together. Here he is leading his band of merry pranksters into the water, making ‘lake music’ and clearly having a lot of absolutely contagious fun. Here’s another exploration of sound, Hermeto eliciting the music from a sportscaster’s description of a football play, ‘Tiruliruli’. Here’s a wonder called ‘Chorinho Pra Ele (Little Cry For)’, from the 1977 album “Slaves Mass”. And here’s the same song sung by his god-daughter, Luciana Souza, who in my humble opinion is nothing less than The Best Female Vocalist working today. It’s from her brilliant CD “Brazilian Duos II”. What shall I choose as my Song of The Week? From the 17 CDs I’ve been trying to incorporate into my musical soul, here’s ‘Santa Catarina’, pulled almost at random out of his hundreds, probably thousands of miraculous creations. My friend Miki explained to me the background of the song: Dorival Caymmi wrote a classic early Bossa Nova song, ‘Minha Jangada Vai Sair Pro Mar’ (my fishing skiff is sailing out to sea), which we all know from innumerable versions. It describes a fisherman’s fears and prayers (in a minor key), that he will have enough wind (but not too much), will return safely, and with a good catch. 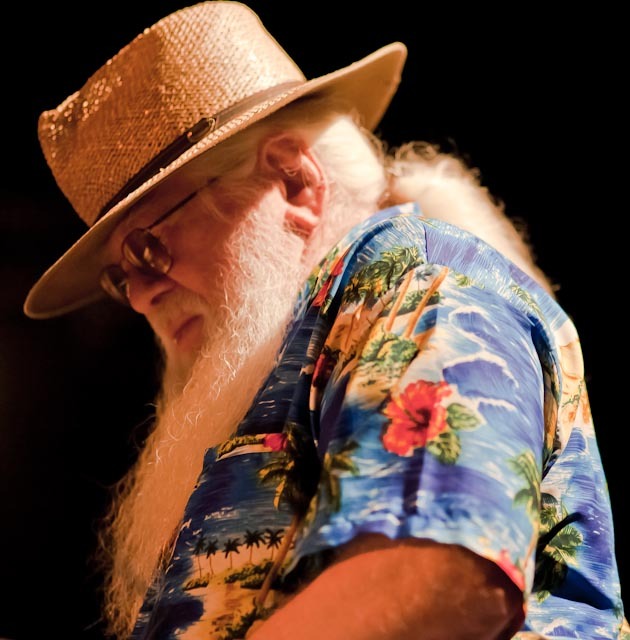 ‘Santa Catarina’ is Hermeto’s sunny, major, optimistic take on that song. It’s from the 1984 album “Lagoa Da Canoa Municipio De Arapiraca” (The Arapiraca City Canoe Lake). Santa Catarina is an island off the coast of southern Brazil. The boat may be a canoe in the man-made municipal pond of the album’s title. He glories in the beautiful weather, and he returns with a boat full of fish. “This was the greatest day of my life,” he says. It begins with undefined natural sounds—wooden beads? rain in the puddles of a dirt yard? A man speaking. I don’t know what he’s saying, but it’s warm and gentle and convincing. A distorted keyboard. Birds. Some instrument approximating wind. A dog yowling – no, sorry, that’s a man excited – a ship’s bell. The melody is at least tripled on flute, a faint voice and the mangled keyboard, a tune so endless, pointless, serpentine, sweet and warm that you want to cuddle up and just lie there hugging it. As Miki says, Hermeto has one single credo: abundant love. That’s the tame, melodic recorded version. Here’s a live version, where he uses the tune as a springboard, and moves on to play his beard, a clay whistle, a gurgling pan, a tin teapot, and an air pump that I won’t even attempt to describe. 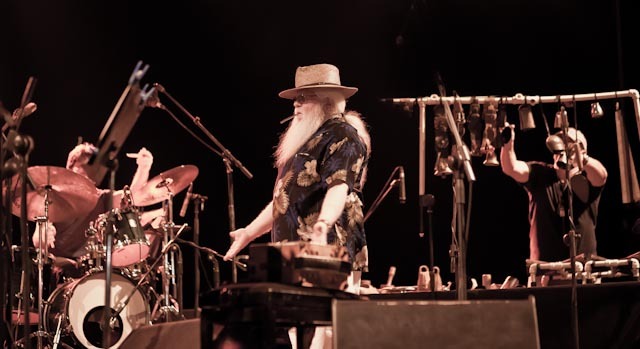 In his homeland, Hermeto Pascoal is known as o Bruxo (the Sorcerer). He is indeed a weaver of wonders, creating a musical rite of enchantment. God bless those Brazilians. Great thanks to David Rubin for the great photos. As close to life-changing as music gets. Simply put, Hermeto is a genius and his god-daughter is as well. Ad meah v’esrim. Kol haKavod and thank you for this!! The one in the clips here is Aline Moreno. She’s his child-bride, about 35 years younger than him. She’s part of his group. His god-daughter is Luciana Souza, a Brazilian-American jazz singer turned pop singer, who is IMHO a great, great artist. Words cannot describe his music. However, I have one word of advice: his recorded music are so different than his live performances, it is like comparing an “Americano” coffee with a “doppio” – a weaker version of the extra-strong drink. 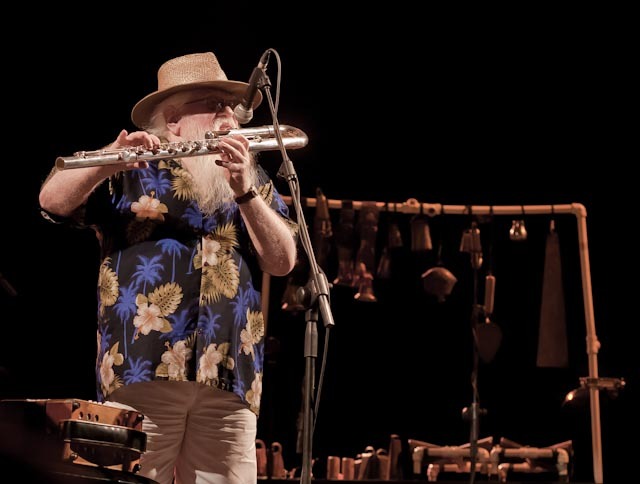 Being a Brazilian I have been able to watch Hermeto’s performances for several years, and in each and every show he succeeded to surprise me. I have attended this show with mixed feelings, but there he was, as strong as ever, even better than I can remember him, so abundant with love and almost demoniacal musical irreverence, all the musicians frantic and almost desperate to play, and Aline so full of joy and love as well… Well. I wish he would come more frequently to these parts – maybe Petra ? – and share his musical wisdom to a wider audience. Itibere Zwarg in a side note: he is a veteran Hermeto band member, and as such has absorbed much of his musical complexity and brilliance although he has yet to produce a mega star group. 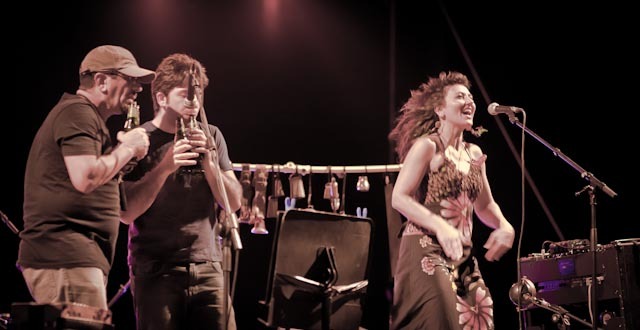 His band, the Itibere family band, is composed of young musicians eager to experiment and all very good players, but – how to say – he is still standing on a giant’s shoulder, and a very crazy one, so that it is hard to stabilize – to find one’s own expression while trying to speak “like” Hermeto. More probably, Itibere’s band exists on its own terms, and not to be compared to Hermeto’s groups. 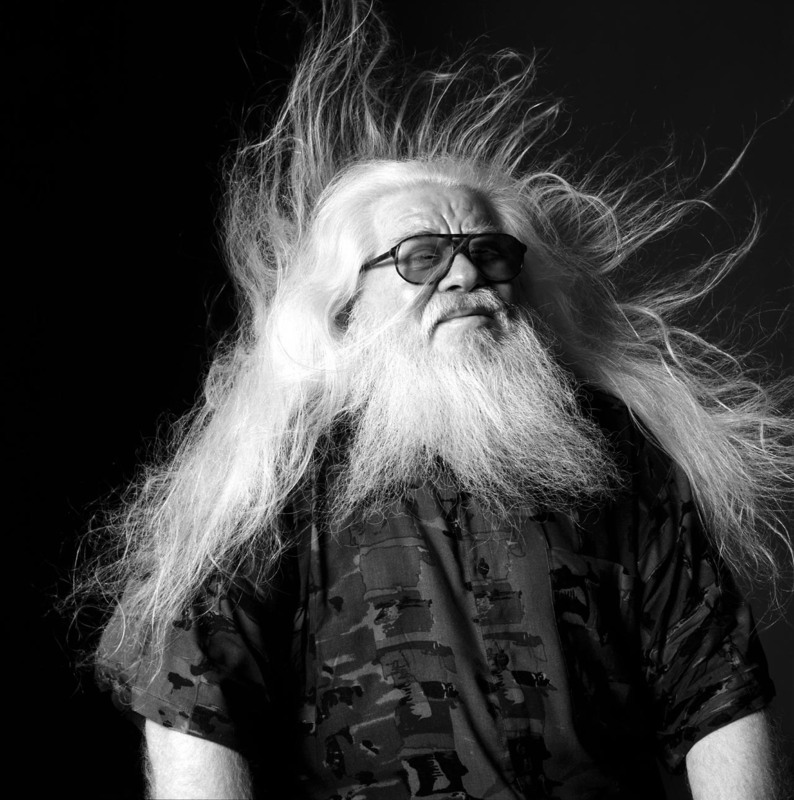 Hermeto has such an enormous presence and charisma that is impossible to reproduce IMO. Such genius appear rarely throughout history, that has produced people like Einstein, Mozart, Da Vinci and very few others. He is one of the chosen, and as such, has a large group of followers, but his colors are so multiple and varied that one can only contemplate and enjoy, but not duplicate or enhance. I could write much more, but it could never convey what Jeff, me, or a couple of Finnish guys that came all the way from Finland (and hitchhiked part of the way) to see the Bruxo. Lucky guys we are.